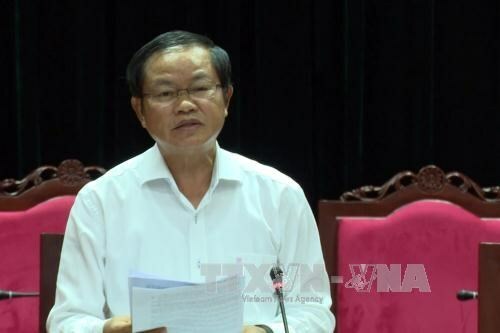 Son La (VNA) – Vice Chairman of the National Assembly Do Ba Ty urged the northern mountainous province of Son La to focus resources on addressing the consequences of floods during a working session with local authorities on August 6. The province needs to mobilise efforts to support households who lost family members to the floods, search for missing people and ensure food safety for residents, particularly in hardest hit Muong La district, Ty said. He also asked the locality to evaluate the impacts of climate change, improve forecast work, and minimise damages for residents. As of August 6, floods took the lives of 10 people and left five others missing in Muong La district. The disaster damaged 398 houses, washed away roads, caused blackouts in five communes with 7,600 households and isolated seven communes in the district. According to the steering board for natural disaster prevention, search and rescue of Son La province, locals and soldiers have been mobilised to help move people made homeless in the floods, to safer places. The province has provided financial and food aid for families with dead, injured or missing members, and evacuated families, worth more than 3.1 billion VND (136,400 USD).